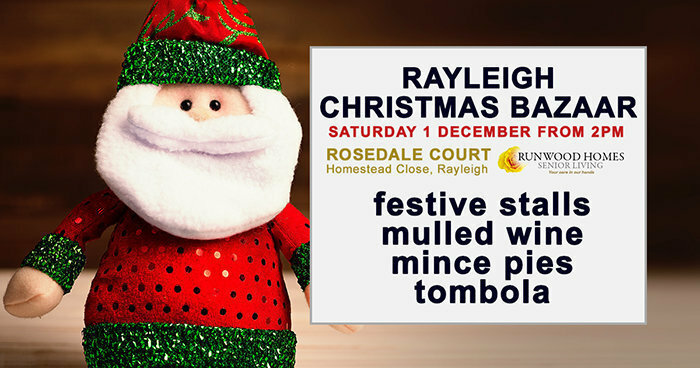 Rosedale Court residential care home in Homestead Close, Rayleigh are hosting a Christmas Bazaar on Saturday 1 December from 2pm, and we hope you can pop along! Join us for an afternoon of mulled wine, mince pies, tombola and a lovely variety of Christmas gifts for sale. Meet our residents and chat to our care team – we are looking forward to welcoming you. See our lovely Christmas lights and decorations, enjoy some festive treats, and join us to get into the Christmas spirit! For more information, contact Rosedale Court on 01268 773180 or email rosedale.court@runwoodhomes.co.uk. Rosedale Court is a beautiful residential setting in Rayleigh, Essex, providing expert care for older people. The home offers respite, reablement, dementia care, nursing care as well as offering support to those who are fully able and are requiring a retirement home option. Read more about Rosedale Court by clicking here.